So, I know I'm a couple of months late for this post, but I blame it on my blogging absence. I've actually been quite good about keeping up with this year's resolutions. One, I'm finding, is particularly popular with my family and friends. Rather than make my yearly promise to loose weigh (which is rarely an attainable goal for me), I decided instead to do a 180, throw caution to the wind, and bake! I've latched on to Tuesday's with Dorie, albeit a little late (I started in mid-January), and just on my terms: one recipe, once a week, any day of my choosing. 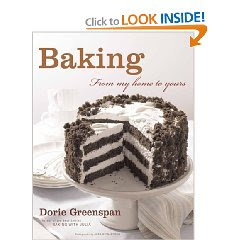 If you're in the market for the best baking book, be it for gift or a treat for yourself, this comes highly recommended. Starting this week I will share my own creations with you! And a few other resolutions - laugh if you must - 1)gym 3-4 days a week (Seriously, I'm eating a lot of baked goods); 2) read more (see previous entries!) 3) take a knife skills course (I cut myself frequently); 4) do puzzles (I love a big mug of tea and a puzzle, and I rarely take the time to myself); 5) knit more; and 6) cook a rack of lamb (my favorite meal that I've never attempted to make myself). I like your resolutions! Especially the fact that they include baking. I'm going to have to take a look at that book.